Greek premier Alexis Tsipras on Friday sought to rally his party and the nation with a speech to parliament, as talks with creditors came to a new standstill. "You’ve been asking for months why we won’t just sign the new agreement," he told the conservative opposition. "Now you’ve seen what it contains. I ask you – would you sign it?" "I advise you to resume negotiations from the Hardouvelis email," responded former premier Antonis Samaras, referring to a controversial set of cost cuts and revenue measures his finance minister, Gikasd Hardouvelis, proposed in November. "It was a relatively painless set of measures compared to what you're being asked to do." 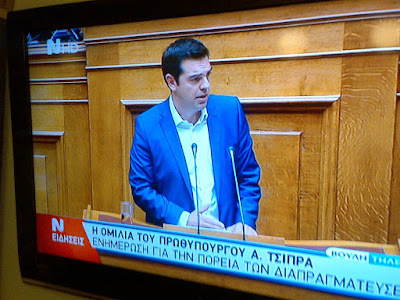 Tsipras: "It goes against European values to enslave and subjugate a people. And if that is attempted, it will bring exactly the opposite result." Two Greek ministers on Friday spoke of the possibility of holding elections should talks with creditors fail, in an indication of mounting frustrations. “If they don’t go back on this package [of austerity measures], neither will the government go back, so objectively it must ask for another way out, i.e. elections,” social welfare minister Dimitris Stratoulis told Antenna television. Talks have crashed through two deadlines of April 30 and May 31. The ultimate deadline is June 30, when Greece’s emergency funding programme ends. The government on Friday unveiled details of its proposal for a new deal with its creditors, the European Commission, European Central Bank and International Monetary Fund. It also revealed details of its creditors’ counter-proposal, which it said reverts back to the starting point of negotiations four months ago. “The Greek government’s proposal does not reflect its original position, as expressed in election promises, but is the product of retreats and compromises,” the government said. “It turns out these people don’t recognise that it was their memorandum [of austerity measures] that flattened the economy,” said Stratoulis. In a letter to the Financial Times on Friday, Joseph Stiglitz, Thomas Piketty and two dozen other academics pleaded for sanity and humanity. “It is wrong to ask Greece to commit itself to an old programme that has demonstrably failed, been rejected by Greek voters, and which large numbers of economists (including ourselves) believe was misguided from the start,” the letter said. The Greek document reveals that there has been some convergence on the big issue of debt repayment. Greece suggests spending 9bn euros over the next three years (at today’s GDP), while creditors want 10.8bn euros. Still, that’s a far cry from the 21.6bn demanded in the programme as it stands. The Greek side wants more of a respite now, in order to rebuild growth and create jobs first – which was a central election pledge. Here is the chart provided by the government, outlining debt repayments as proportions of Gross Domestic Product (GDP), i.e. the economy. Each point of GDP is 1.8bn euros given that the Greek economy is today 180bn euros. The two sides disagree greatly on consumer tax, or VAT. Greece wants VAT on electricity bills to go down two points to 11 percent, and medicines to go down half a point to 6 percent. Creditors demand 11 percent for medicine and 23 percent – a ten point hike - for electricity. The Greeks say that creditors’ demands would raise 1.8bn euros more a year from VAT, or one percent of GDP. Since consumer tax is applied indiscriminately, it disadvantages the poor, and Syriza has vowed to rebalance tax revenues to relieve them. Its first act of parliament after taking power on January 25, was to spend 200mn euros this year helping to provide food, shelter and electricity for poor households. Studies suggest that one third of Greeks are currently living below the poverty threshold of 7,756 euros a year. Perhaps the greatest disagreements come on pensions. Creditors want all Greeks to retire at 67, given that the population is ageing, and they want pensions to fall by one percent of GDP a year. This is because pension funds cannot cover their costs, and the government spends 1.5bn euros a month underwriting them. Of the 29bn euros that pensions will cost this year, the government will pay 16bn – just over half. By comparison, in 2000 it paid only 20 percent of pension costs. The outlook is that as more people retire, (a quarter of the population is already retired), state expenditure will increase. Creditors propose cutting pension top-ups (EKAS) to low-earning retirees. The government protests that this would reduce their monthly income from 488 euros to 200. It also points out that the top-up fund is one to which only pensioners have contributed, and the government is therefore not entitled to take it away. The second major change creditors want is to phase out auxiliary pensions by next year. This would reduce the average pension (which now stands at 800 euros) by roughly one third. Austerity governments had agreed to the measure. The implication is that Greeks would invest in a private auxiliary retirement plan, or IRA. But Syriza is against this; it is ideologically committed to a comprehensive, redistributive retirement system that is guaranteed by the state. Syriza promised voters in January to effect no further cuts, at least for now. It has instead suggested isolating revenue streams that would flow directly into pension funds, making them independent and effectively insulating the national budget from surges in pension costs. Syriza says it has also agreed to effectively stop early retirement, and to consolidate the country’s 13 main pension funds. This would streamline costs but also benefits paid out, potentially lowering them to the highest-paid retirees. The big tax scuffle (other than VAT) is over whether to abolish a highly unpopular property ownership tax, ENFIA, levied as an emergency measure in 2011 but made permanent in 2013. A recent study found that it increased the total tax Greeks pay on property by more than a thousand percent during the crisis. Syriza vowed to abolish it, but it also vowed to preserve balanced budgets. The two promises aren’t currently compatible, because ENFIA brings in 2.65bn euros a year, which Syriza cannot replace. Before the January election, Syriza thought it would find 3bn euros a year by aggressively pursuing tax evasion. A bill to crack down on fuel smuggling, online gaming and overseas transactions through tax havens has been delayed, perhaps pending ongoing talks. Syriza also counted on collecting another 3bn euros a year by tapping tens of billions in tax arrears. A careful audit, however, has since revealed that only 9bn euros are immediately collectible, since most of the arrears are owed by bankrupt entities and state entities, or are caught up in litigation. While Syriza has helped 380,000 people settle 2.8bn euros of arrears through an instalment plan, it is nowhere near generating an extra 3bn this year. Syriza has agreed to a slew of reforms in the tax administration. This includes a more independent and empowered General Secretariat for Public Revenue, which would in theory be isolated from political pressures, a new tax code, a budget law curtailing overspending, and a Fiscal Council to advise the government on long-term planning. Laudable as they are, though, these measures will take years to affect revenues. Austerity governments managed to trim the public wage bill to 620,000 people, from an estimated 950,000, by the time Syriza came to power. Syriza is against further layoffs, labelling it a recessionary measure. Moreover, it is pushing to rehire, something the government can ill-afford. It is vehemently against further salary cuts in the state, saying this is another recessionary measure.